These telephone ringer amplifiers possess a very loud ringer volume level, and a few are aggregated with a blinking light that flashes whenever a phone call is invited. These amplifiers possibly demand a mains powered adapter, or are operated via batteries, or just the phone. Ideal alerts for elderly folk. 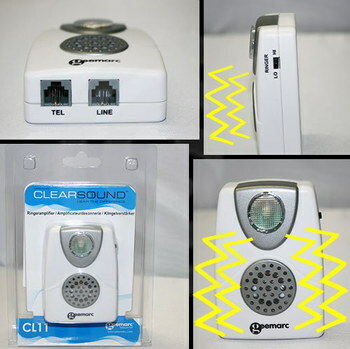 This universal flashing telephone 'amplifier for hard of hearing' and call alert is a line powered light and ringer device which plugs directly in to any BT type telephone socket. 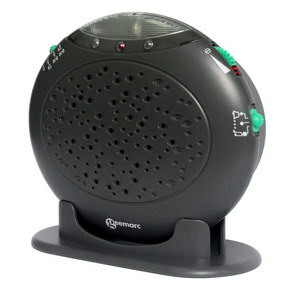 It flashes and rings whilst the telephone is ringing, however is an ideal solution for the hard of hearing, or for use in noisy environments, anywhere indoors. 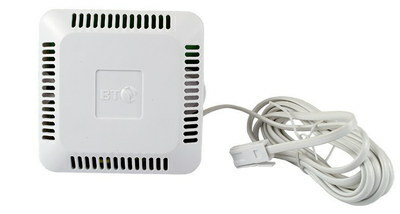 It can help ensure no calls are missed and is compatible with most telephones with a regular BT style line outlet and will not require additional leads or adapters. 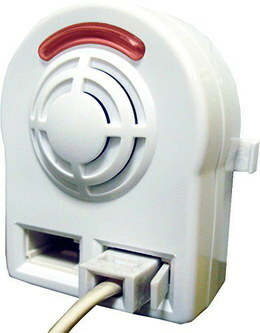 User friendly, it simply plugs in to your standard telephone socket to produce a loud ring where the volume can be adjusted with flashing alert. BT 4 Tone loud indoor telephone ringer with it's loud adjustable soud makes it ideal to recognise when your BT phone is ringing. It features an 'extra audible alert' if you are having problems hearing your telephone ring. A choice of four different pitch settings and easy to change volume control and plug this additional bell in to a spare telephone socket. You can use a socket adaptor to plug it in beside your existing phone. Telephone lines usually have an (Ren) of 4, although they can operate up to four telephone products like fax or answering machines each with a Ren of 1. Compact and lightweight design, can be easily positioned out of sight. When your landline rings, this telephone ring amplifier indicator will ring rather loudly at around 95dB, and will blink to let you know there's an inbound call. The Amplicall gives you choices of vibrant strobe and sound. You can purchase separately the optional vibrating shaker pad. This is an ideal solution for deep sleepers who are expecting crucial phone calls at night-time. It can be linked to a second unit in order to extend it's range. It's features include a high volume ringer up to 95dB, high volume plus a visual phone ring indicator and optional shaker. Also has been designed to alert you with an extra loud adjustable ringer. The Amplicom ring-flash 'loud phone ringer amplifier' is ideal for users who suffer with hearing loss or work in noisy environments, as it has a bright flashing light and loud ringer for incoming calls. The ring volume is adjustable and it also owns several melodies available to choose from. It is fully compatible with the PowerTel series and other telephones. 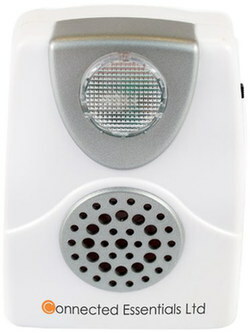 As a diverse device, the amplifier connects between the phone and the socket. For the hard of hearing, just set your hearing aid to the (T) position. 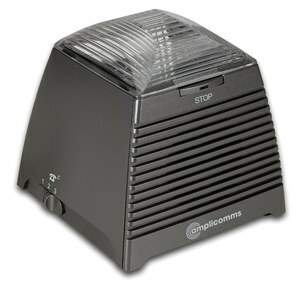 The Amplicomms call amplifier will provide a clearer sound without interference - while illuminating when calls come in with the extra bright flash indicator. Double output phone amplifier for hearing impaired offers flashing, with an easy operation - simply plug in to your telephone or fax line. Designed for the elderly, the deaf or just the hard of hearing. It is also great in all noisy locations, such as garages, factory, office, shop, warehouse or just around the busy home. The ringer volume amplifies louder than the normal ring, also an orange 'vivid neon light' gleams when the phone rings to signal to you. This is the perfect hearing aid with 2 outlets that allow 2 phones, or one phone and one Fax to operate together, great for the elderly or hard of hearing. Ideal for people with hearing impairments who struggle to hear the phone ringing. This compact, 50mm, 2 inches diameter loud hearing amplifier is complete with '2 port' adapter socket. The smart white unit houses a loud 85dB bell, which will ring every time your phone does. Needs no batteries and has an on-off switch. You can bypass the amplifier if desired. No wiring required, comes complete for instant plug-in operation - simply unplug the telephone from it's socket, plug the ringer amplifier in it's place - and then plug the telephone back in to the socket. This portable telephone with ringer amplifier sits between your phone device and the wall line to elevate the volume level of the ring. The RJ11 amplifier works nicely for inbound calls in noisy areas. It helps those hearing impaired folks plus heavy sleepers, elderly people and assists those who just love wandering far from their phones. Connect it the telephone line, so no other electrical power is needed. For installation, please connect the c and o line plug with ringer jack. The plug of the ringer connects effortlessly with the telephone. Phone Amplifiers For Hearing Impaired With Loud Volume Controls.. These telephone ringer amplifiers are small sized and elementary gadgets which noises a clear, loud signal when it experiences an inbound telephone call, creating a volume level of as much as 95dB. The ringer amplifier is extremely leisurely to set-up - just run the wire that's provided from your phone to the ringer amplifier..